Beauty sells in today’s world when everyone is trying to please everyone, the conquest to be the perfect beauty on the block is rising like never before. Be it the lustrous centerfolds of your favorite magazine or the glossy supplements of the dailies, there’s an overdose of perfect beauty. But in way towards putting your best face forward, you have to face problems like open pores. 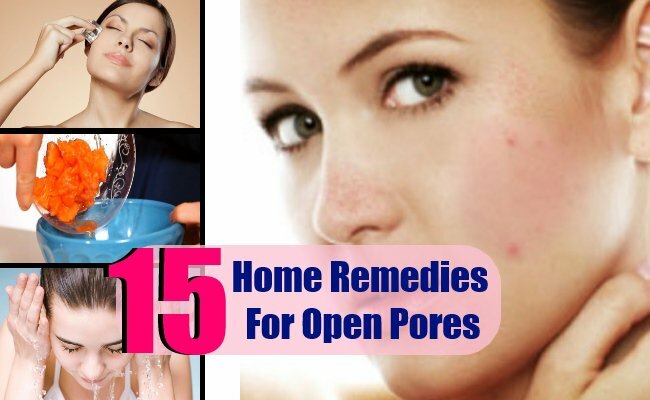 And unlike most people who think paying a visit to their dermatologist is the only way out, there are several home remedies which are the most sought after treatments to treat the case of open pores. Open pores can be a result of your genetic makeup, hormonal changes, environmental factors, nutrition, stress, any health condition or just a result of your skin type. People with oily skin tend to have more open pores as their skin has over active sebaceous glands which keep producing oil. This continuous process results in clogging of pores and losing of the elasticity of the skin leading to open pores. lemons are laced up with their natural enzymes and acidic nature to shrink the pores due to any reason. They are one of the most widely used herbal remedy to shrink the open pores as they naturally tighten the skin and brighten it too. As mentioned earlier, open pores can be the result of lack of proper cleansing resulting in the deposit of oil, dirt or even dead skin in your pores. It is extremely important that you follow the ritual of a face clean at least once a week which includes a massage with a cream, exfoliation for the removal of dead skin cells and a face pack to close the pores opened while the process of exfoliation. This basic routine makes sure that your skin is always prepped up, cleansed and clear of impurities. if you’re one of those people who don’t know which skin product is the best for your skin, then tread the natural way. Fruits like Papaya are best known for their exfoliation properties. Using a papaya for cleaning the face not only scrubs away all the impurities but also helps in removing black heads and other impurities of the skin. An instant remedy for open pores is using ice on your skin. It works instantly as the extreme cold nature causes the skin to shrink and thus close the pores to stop any kind of dirt or residue to enter and clog the pores. Honey is famous for its medicinal, cosmetic and healing properties which makes it a favorite among most people. It can be used on the skin for natural toning and closing of the pores and also reducing the excessive oiliness of the skin which is among the main factors for open pores in the first place. Oatmeal: It is used in various facemasks for its hypo allergenic qualities. It doesn’t clog the pores and instead helps shrink them and enhance the overall complexion. Egg whites work as natural dryers of the skin and thus they greatly help in shrinking the pores and helping with the problem of open pores. They are excellent to lighten the skin and also help in unclogging the pores as they pull out the impurities from the pores. Another way of dealing with the problem of open pores is yoghurt. It has lactic acid which tightens the skin thus reducing the pore size, controlling excessive oil in the pores and also removes dead cells. Almonds, when crushed and applied on the skin as ingredients with face masks can bring out magical results. They are best known for providing a clear and smooth skin texture which helps to close the open pores and minimize this problem. They are the natural astringents which helps remove the extra oil from the pores, shrink and reduce the size of open pores, close the pores which are enlarged giving the perfect solution for this problem. there are several other natural astringents which can be used on the skin for the treatment of open pores like peach, pineapple, orange, strawberries and other citrus fruits. Not only are they rich in anti oxidants but they are excellent for all skin types providing the perfect smooth and clear complexion. It’s known for its several uses in home remedies. Fuller’s earth is an excellent medium to control excessive oil and cleansing the skin gently and deeply.But people with dry skin should it a little cautiously with mediums which have moisturizing effects like honey or oil to make sure that it doesn’t dries their skin out. Steaming your face is a great way of opening the clogged pores which have lost elasticity and then cleaning them deeply making sure they are not trapping oil in the skin and thus splashing cold water instantly closes them making sure the cycle of clogged pores and open pores ends there. Also, any natural astringent can be used after steaming to close the opened pores. It’s a miraculous way of making sure that the oil produced by the skin is under control and thus rose water makes sure that the skin is cleansed deeply and impurities removed. Aloe Vera is known for its healing properties. Aloe Vera gel can be applied to make sure you get a supple, clean and clear skin and the problem of open pores is taken care of. To prevent such situation you should follow a good skin care regime regularly and make sure that the products that you use suit your skin type. Using of sun screen, exfoliation, cleansing. Also you should include fresh fruits and foods that are raw, steamed, roasted rather than fried and unhealthy fast foods which are excessively greasy to make sure that don’t aggravate the oil glands to produce excessive oil. This is also one of the naturally occurring astringent that can be brought into use when making special face packs to make sure that the problem of open pores stays in control. There are various other ways of dealing with the problem of open pores like applying a spoonful of milk of magnesia after you wash your face, the juice of lettuce leaves combined with lemon juice, a sugar scrub with a little olive oil and lemon juice, trying orange peel as an alternative to soap if you have an extremely sensitive skin, using homemade toners made of butter and salt, using glycerin and vitamin E is another effective option. Following home remedies if used bring out definitive results in the problem of open pores to make sure that there’s nothing that puts you down.